Dishonored scores its first DLC today, but story junkies will probably be unimpressed. If you're itching to return to the plague-filled streets of Dishonored, the first piece of add-on content pops live today for Xbox 360, PS3, and Steam. Titled Dunwall City Trials, the DLC features a total of ten challenge missions that task you with performing assassinations and completing various objectives. Unfortunately, Dunwall City Trials doesn't add any type of actual story content to the well-received stealth action title, and will likely only serve as a minor aside for fans of the game. Dishonored is expected to see its first story-based DLC next year, which will come in the form of two separate releases. 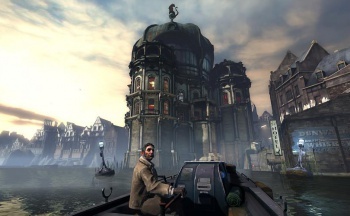 Dishonored turned out to be a bit of a pleasant surprise for many gamers in 2012, and the game currently holds lofty aggregate review scores in the low 90s and high 80s. Escapist's own Susan Arendt scored the title 5 out of 5, noting that it will inevitably pop up in Game of the Year conversations across the web. Dunwall City Trials is priced at a very reasonable $5 (or 400 Microsoft points), so if you simply can't pass up some additional Dishonored content, it won't exactly break the bank. But if more narrative is what you crave, you'll need to wait until at least Spring 2013.